A few years ago GC-TOF-MS system was introduced with a "Select-eV" ion source that was claimed to be a "Revolutionary technology for GC-MS offering variable-energy electron ionization with no loss in sensitivity". This low eV EI was subsequently named as "Soft EI". Recently, another major GC-MS vendor introduced "Low-energy EI" in its GC-QTOF-MS with the claim of having a "Soft EI" alternative to chemical ionization that enhances the relative abundance of molecular ions in EI and defined it as "a paradigm shift in GC/MS soft ionization". Another vendor has an ASMS 2018 presentation titled "Soft Ionization of Volatile Organic Compounds Using a Novel Dual Mode Electron Ionization Source". These titles and related application notes create the perception that electron ionization can serve as a general soft ionization method at low electron energies. However, as we demonstrate and explain below these claims are often incorrect, and/or a major exaggeration. In fact, low eV EI has been a known option for over 50 years and it is available in any Agilent 5977 GC-MS on the market but rarely used due to its known limitations. Low eV EI is not a universal soft ionization method simply since for most compounds that exhibit weak or no molecular ion at 70 eV EI it does not provide abundant molecular ions. For small molecules that exhibit molecular ions at 70 eV EI, low eV increases their relative abundance but this alone adds only little new information. On the other hand, Cold EI provides far softer ionization than low electron energy EI, and it possesses many major advantages over standard EI, too. In figure 1 we compare the mass spectra of squalane (C30H62) isoprenoid hydrocarbon as obtained by the Aviv Analytical 5975-SMB GC-MS with Cold EI (upper MS) and Agilent 5977B with its standard EI ion source operated at 14 eV low electron energy and at 280ºC ion source temperature (lower MS). Figure 1. 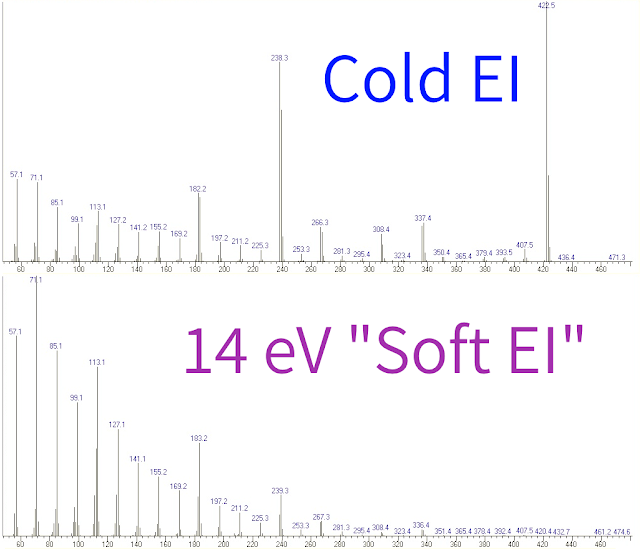 Comparison of electron ionization mass spectra of Squalane (C30H62) isoprenoid hydrocarbon as obtained by GC-MS with 70 eV Cold EI (upper mass spectrum) and by Agilent 5977B with its standard EI ion source operated at 14 eV electron energy which is sometimes called "Soft EI". Note the qualitative difference between dominant molecular ion at 70 eV Cold EI versus no molecular ion at 14 eV low electron energy EI. As demonstrated, while Cold EI provides dominant molecular ion in combination with highly amplified structurally informative fragment ions, the 14 eV low electron energy ion source provided a mass spectrum which has zero (<0.01%) molecular ion abundance and which is substantially lower even than the 0.2% relative abundance in the NIST library mass spectrum of squalane. Accordingly, the low-eV "Soft EI" is not soft as claimed and represents a false claim. On the other hand and as shown, Cold EI provides for squalane 10,000 times more abundant molecular ion than the 14 eV low electron energy "Soft EI" and its dominant molecular ion is further highlighted with abundant structurally important high mass fragment ions. We found the same behaviour of low eV EI with practically no molecular ion for squalane also with the 5975-SMB GC-MS when its fly-through ion source was operated in its classical EI-SMB mode with 5 ml/min combined column and make-up gas flow rate and 14 eV electron energy. We explored 14 eV EI with several other compounds and concluded that the enhancement of the molecular ion in most tested compounds is far smaller than claimed. In Table 1 we summarize our data for the following 6 compounds: hexadecane (50 atoms), tetracosane (74 atoms), haloperidol (49 atoms), cholesterol (76 atoms), dioctylphthalate (66 atoms) and squalane (92 atoms). In general, the molecular ion enhancement effect via lower electron energy EI is reduced as a molecule contains more atoms in view of the growing role of thermal energy on molecular ions fragmentation. Table 1. Molecular ion relative abundance data at 70 eV standard EI, 14 eV low electron energy EI, NIST library (Main Lib) and 70 eV Cold EI mass spectra of the tested six compounds. Same emission currents of 36 µA were used in 70 eV and 14 eV EI as well as 280ºC ion source temperature (for standard EI). As shown in Table 1, for all these six compounds, the effect of reducing the electron energy from 70 eV to 14 eV (which is just 4-6 eV above the ionization potentials) is "surprisingly" small. For hexadecane (n-C16H34) the lower electron energy barely increased the molecular ion relative abundance from 4% to 5.2% (30% higher) and the enhancements for tetracosane (n-C24H50) and cholesterol are not much better. Meanwhile, the low electron energy had no effect on the molecular ion abundance of dioctylphthalate (C24H38O4), haloperidol, and squalane. In fact, the NIST library mass spectra (Main Lib) at 70 eV have essentially similar or even higher molecular ion abundances in 5 out of these 6 cases as at 14 eV low electron energy EI. The reason of this observation is that slightly reduced ion source temperatures induce a much bigger effect on the molecular ion abundance than electron energy reduction, and some of the NIST library MS were obtained at ion source temperatures below 280ºC. However, the most impressive observation is that 70 eV Cold EI is a far softer method of ionization than low electron energy EI for all the 6 compounds tested. The molecular ion was the base peak in Cold EI for 4 out of the 6 examples, and even for the other two, the Cold EI molecular ion abundances of 8-18% was 150-400 times greater than with 14 eV low electron energy EI. Furthermore, the high mass fragment ion m/z 279 was dominant in Cold EI MS of dioctylphthalate while in 14 eV low electron energy EI it was only 14% relative abundance. The conclusions drawn from Figure 1 and Table 1 are practically universal and Cold EI is far better/softer than low electron energy EI. Recently, certain GC-MS vendors highlighted low electron energy EI in ways that could give the impression that electron ionization can become a soft ionization method at low electron energies. In this application note we demonstrate and explain that this claim is a major exaggeration as while low electron energy EI brings some value its enhancement of the molecular ions is far lower than generally perceived and/or claimed and far inferior to Cold EI. In fact, I have never seen an example of no molecular ion in 70 eV EI becoming an abundant molecular ion at low eV EI. Furthermore, it is questionable if the limited gain in enhanced molecular ions in low electron energy EI justifies the additional low eV analysis and its inevitable total ion count signal loss which at 14 eV was measured as a factor of 37 for PFTBA and about 4 for other compounds (compound dependent) and which strongly depends on the electron energy. The following is a general discussion of this subject. Low electron energy EI is not new. The use of low electron energies in electron ionization (EI) is known for over 50 years and in any standard Agilent 5975 or 5977 based GC-MS the user can "Select" the electron energy and the filament has sufficient power to give the optimal emission current for most selected electron energies. The only recently added design change is possibly that an additional lens is now added to improve the extraction of electrons at low energies but it does not affect the low eV EI generated mass spectra. Why do molecular ions dissociate in EI. There are four reasons for this observation: a) The chemical bonds in an ion are weaker than in the neutral compound in view of having one less electron for bond formation; b) The electron ionization process imparts up to a few eV internal vibrational energy into the ion; c) The compound thermal vibrational energy (internal heat) is carried into the ion in the ionization process; d) The sample compound can degrade at the metallic ion source surface that act as a metal catalyst. Low electron energy EI addresses in part only reason (b) while Cold EI addresses reasons (c) and (d) and if desirable can use low electron energy and further address in part reason (b). Accordingly, low energy EI has little or no effect where needed for large, or polar or delicate compounds that do not exhibit molecular ions in their 70 eV EI while it enhances molecular ions of small and stable compound that exhibit molecular ions and thus low eV EI is not needed for them. The effect of electron energy on the molecular ion abundance is far smaller than claimed. The effect of the electron energy on the ions internal vibrational energy that leads into fragmentation is highly non-linear with the electron energy. Only a small portion of the electrons kinetic energy (few eV at most) are added to the ion by the electron ionization process and above 30 eV there is practically no further effect of the electron energy on EI mass spectra. The effect of low electron energy on the reduction of molecular ions fragmentation emerges from the fact that sample compounds can be ionized into a few ion electronic states and as the electron energy is reduced the high lying ion electronic states become inaccessible. However, nature via Franck-Condon factors (probability of ionization into a specific electronic-vibrational state) implies that often (particularly for compounds with weak chemical bonds such as with certain heteroatoms) only one ionic electronic state is practically accessible since the high lying electronic states usually involve with shifted atomic nuclear positions and thus the Franck-Condon factors of such ionization processes are extremely small hence there is no or only little electron energy effect. We found for example that when heteroatoms are present in the sample compound such as with most pesticides the reduction of electron energy has hardly any effect. The simplest and easiest example to explore is PFTBA for which there is no molecular ion m/z=671 at any electron energy. The dominance of thermal vibrational energy over electron-given vibrational energy for large compounds. Large compounds such as squalene (C30H62) has 92 atoms thus 276 vibrational degrees of freedom and at 280ºC ion source temperature its high temperature vibrational heat capacity is 13.3 eV. Accordingly, even if the real thermal energy content is half of that value it is far higher than the few eV vibrational energy that electron ionization imparts and far higher than any organic compound ion bond energy. Consequently, for large compounds low electron energy can-not bring back missing molecular ions and at Figure 1 we show that fact for squalene. According to the author's estimate the transition to "large compound" is at about and over 40 atoms while thermal vibrational energy has noticeable impact already for compounds with over 20 atoms. The role of Intra-ion-source decomposition. Another reason for loss of molecular ions in EI mass spectra is sample compounds degradation at the ion source metallic surface. Intra-ion-source degradation occurs particularly in large and polar compounds and those with free OH such as steroids particularly at low picogram on-column amounts. One known example is cholesterol that partially decomposes into cholestadiene via loss of water and such decomposition is also accompanied by increased ion source peak tailing, non-linear signal dependence on the sample concentration and vastly increased limit of detection. Delicate drugs such as sildenafil (Viagra) are another example and even for haloperidol we found partial intra-ion-source water loss in EI. For such compounds the electron energy can have no effect on the abundance of the molecular ion since the ionization is of fragments. In contrast, the Cold EI contact-free fly-through ion source is inherently immune against any type of intra-ion-source degradation and this is another reason why it is superior to low eV EI in the provision of enhanced molecular ion. Signal loss and the erosion of response uniformity. One vendor claims that their low electron energy EI comes with no loss in sensitivity. This is an inaccurate and impossible statement. It is well known that the electron ionization cross section increases from zero at the ionization potential quadratically with the excess electron energy above the ionization potential and 70 eV gives about 4-40 times more ions per electron than 14 eV. Furthermore, well-tuned ion sources are dominated by space charge and at 14 eV the electrons produced space charge is higher by a factor of 2.2 than at 70 eV plus there is no He related counter positive ions space charge thus the optimal emission current decreases possibly by over a factor of 2. Furthermore, since the ionization potential is compound dependent and for typical GC-MS sample compounds it is in the 7-10 eV range the electron ionization response uniformity is eroded at low electron energies. The high price of dual 70 eV and low eV scans. One available GC-MS with time of flight mass spectrometer is based on pulsing the ion source voltage (by a few kilovolts) which enables fast change of the electron energy between TOF scans. However and as a result, this GC-MS system has no emission current reading or stabilization and as a result its long term signal stability is bound to be poor and unacceptable for many applications. The overall low electron energy EI effect. As above, low electron energy has little or no effect on the molecular ion abundance for large molecules, limited effect on small molecules with heteroatoms and mostly small hydrocarbons exhibit sizable effect in that their observable molecular ion abundance is amplified. However, if one obtains molecular ion in 70 eV EI there is no need to pay the signal loss and added analysis time penalty to get an amplified molecular ion. In short, there is little or no need for low electron energy EI. The far superior Cold EI as a truly "Soft EI" ion source. The Cold EI ion source includes three modes of ionization in one ion source of: a) 70 eV Cold EI which combines NIST library search ability and enhanced molecular ions; b) Soft Cold EI at low electron energies and; c) Classical EI with supersonic molecular beams with low nozzle flow rates such as 5 ml/min that provide classical EI mass spectra with best matching factors. Cold EI exhibits small enhancement of the molecular ions for compounds with less than 20 atoms, intermediate effect on compounds with 20-40 atoms and large effect for large compounds with over 40 atoms. Thus, the larger the compound the greater is the Cold EI enhancement of the molecular ions. On the other hand, the larger the compounds the weaker is its molecular ion in standard EI and thus the greater is the need for molecular ions as provided by Cold EI yet these are the cases in which low electron energy EI fails. Note that if further enhancement of the molecular ion is needed Cold EI can use low electron energies and for some compounds approach field ionization in having molecular ion alone. The elimination of thermal vibrational energy means that the reduction of electron energy has greater impact in Cold EI than in standard EI. The superiority of Cold EI in all ion source performance parameters. Other than being the best "Soft EI" ion source, Cold EI significantly improves sample identification via the combination of NIST library based identification and the TAMI software that provides elemental formula from its molecular ion isotope abundance analysis combined with improved quadrupole mass accuracy. We claim that the most important Cold EI benefit is that it significantly increases the range of compounds and applications amenable for analysis including more than doubling the size of compounds that can be analysed by GC-MS. Furthermore, GC-MS with Cold EI enables much faster analysis, provides the best sensitivity particularly for difficult to analyse compounds, improves the chromatographic separation, provides uniform compound independent ionization yields and several other benefits. We mention the above benefits of Cold EI mostly to prevent the impression that its feature of "Soft EI" is its most important benefit. GC-MS with Cold EI can and should serve for the next GC-MS revolution particularly for its ability to bridge the gap between GC-MS and LC-MS and analyse much bigger and more delicate compounds that can-not be analysed by any other GC-MS. Accordingly, GC-MS with Cold EI can bring a paradigm shift in GC-MS range of applications and increase the total GC-MS market.